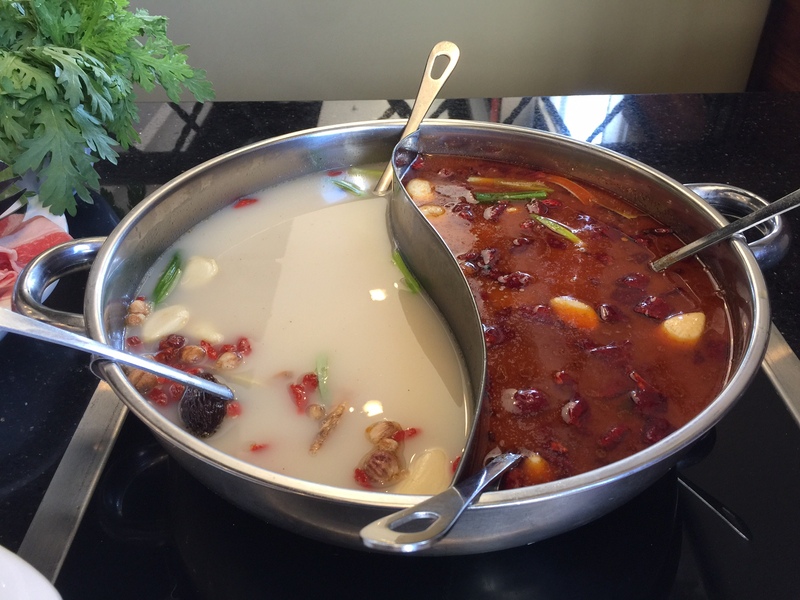 So, how big is Little Sheep Hot Pot? Big. In fact, *really* big. It was really big five years ago. Based in Baotou, Inner Mongolia, China, Little Sheep Group posted 2 percent of all Chinese dining-out expenses in 2010. Think about that for a second. And then, it got *REALLY* big. In 2011, Little Sheep Group was sold to the massive, $10+ billion Yum! Brands, Inc. (the owners of Taco Bell, KFC, Pizza Hut, etc.) 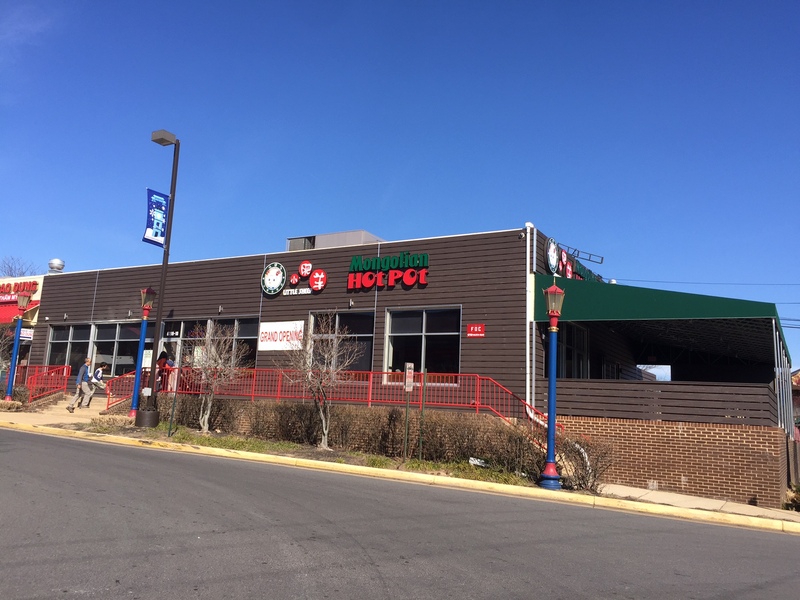 for $587 million, and it's now a wholly-owned subsidiary - they recently opened their first Little Sheep Hot Pot in Eden Center. Ironically, you'd *never* know it was a giga-chain. This restaurant is somethng like Mala Tang, except it has big, *big* money behind it. It's well-organized, family-friendly, and is designed for groups (definitely not the solo diner; unless you want a lot of leftovers). Ordering involves a simple, 5-step checklist, where you check off your broth, your meat, your seafood, your vegetables, and your starch - whichever ones you want. 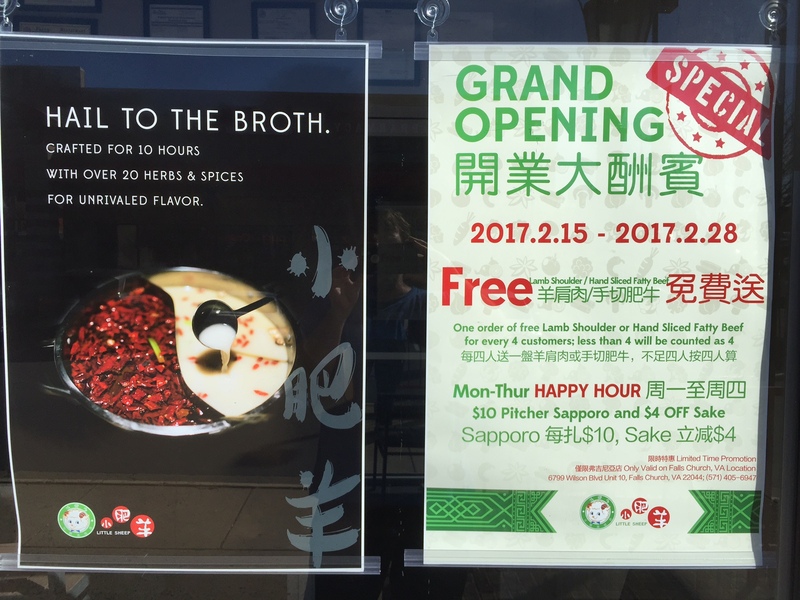 The broth is $2.95, and the extras are what cost the money. I *strongly* advise going with the "original" or the "Yin and Yang"; not the "Spicy" - it's too much. I got the Yin and Yang ($2.95), and for my meat, ordered the Dry-Aged Spring Lamb ($8.95). Tong Ho (a massive pot of Chrysanthemum Blossoms, $4), and Fresh, Thick Noodle ($4). Since it's their soft opening, they threw in a generous little plate of Fatty Steak (Gratis). Considering I made a quick decision, I was very happy with everything I ordered, but you can do even better if you look at the menu before you go, and add even more vegetables - maybe some large mushrooms, taro root, and the like. It's the meats and seafood which will really set you back; not the vegetables. My hot pot, including tax (but not tip) was $23.05, and it could have *easily* fed two people, with leftover broth - one person gets the same amount of broth as four people. That amount also included a Diet Coke with unlimited refills. All the meats seem to be frozen, and the non-seafood in particular are those thin, Steak-Umm-like things - the real treasure here lies in the vegetables. You definitely want some starch (noodles, potatoes, etc.) to thicken the broth as it reduces. The base broth seems to contain every kind of pod, twig, root, spice, nut, and berry known to mankind (the picture below is of the broth before I put a single thing in it - you can *easily* see that unless you're a bonafide chili-head, you don't want the entire thing to be spicy). Here are some pictures to give you a better idea of what to expect. 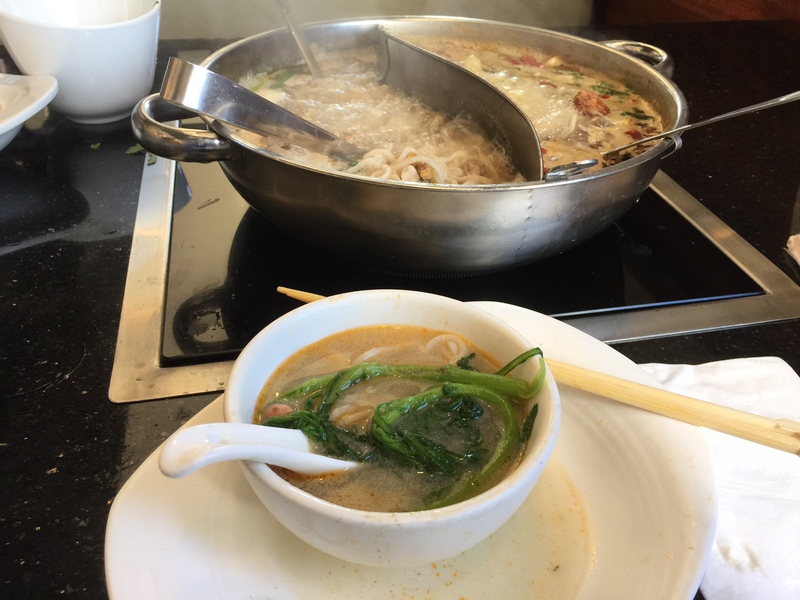 Do not let the "chain" aspect of this throw you off - it's perfectly fine hot pot, and it was packed this afternoon for a late lunch on President's Day. We have one in Houston and it’s eh. 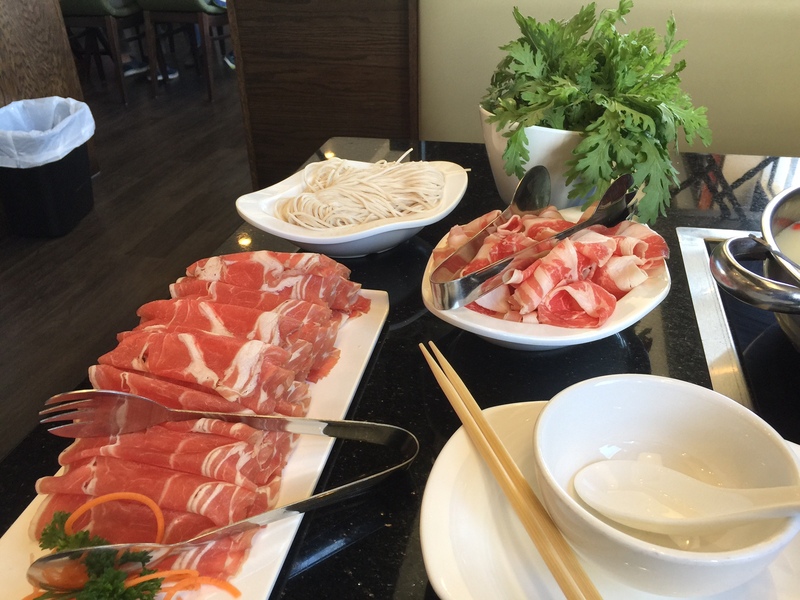 Not going to blow your mind, but for hot pot newbies, it's a reasonably non-intimidating place to start.